A laboratory that enrolls in a program will receive all related samples. Each program is composed of a number of rounds which may include one or more samples devoted to analyzing. Laboratories can enroll in our PT programs at the beginning of the annual series and at any time during the year. Our samples are manufactured in-house and meet very strict requirements in order to guarantee their homogeneity. Those materials are very similar to those analyzed routinely. Spiking can be carried out in order to guarantee the presence of the criteria in the PT scheme. BIPEA has developed a great logistic expertise in the choice of packaging and transport in order to guarantee a fast and compliant sample delivery. 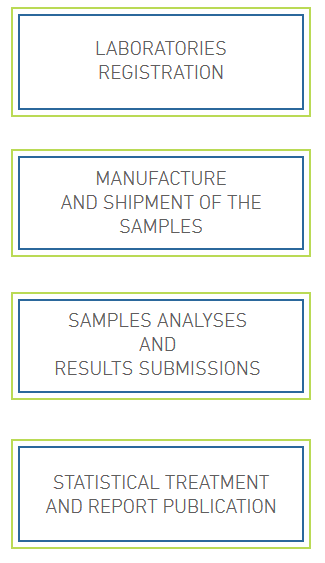 The manufacturing and shipping department assigns a number to each sample, which allows full traceability of samples throughout the round: from the purchase of the matrix to the laboratory result. Upon samples’ receipt, the form is available online. Laboratories are invited to perform the analyses and enter their results before the deadline mentioned on the form. The results of the participants are processed by our statistical department which will publish the Interlaboratory Comparisons Report within 17 working days (on average) after the results’submission deadline.